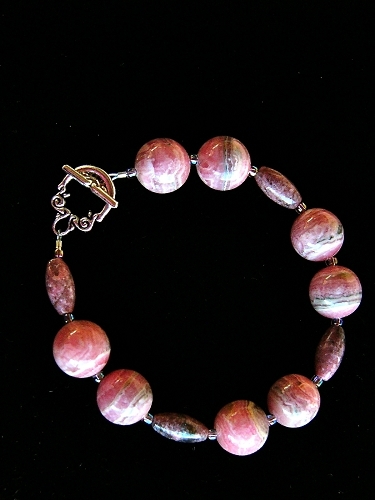 8.5 inch 0.925 Sterling Silver bracelet with 13 mm Rhodochrosite beads, pipe Jasper and glass beads. Rhodochrosite is for the Base to Heart Chakras, and helps with enthusiasm, industriousness, love, and positive attitude toward life. Jasper helps with grounding and protection. Green Chakras are also for pinks.